A Guide to Visiting Myanmar (Part 2): The Beautiful Bagan Temples — 2checkingout | travel and adventure | Inspiring. Capturing. Experiencing. 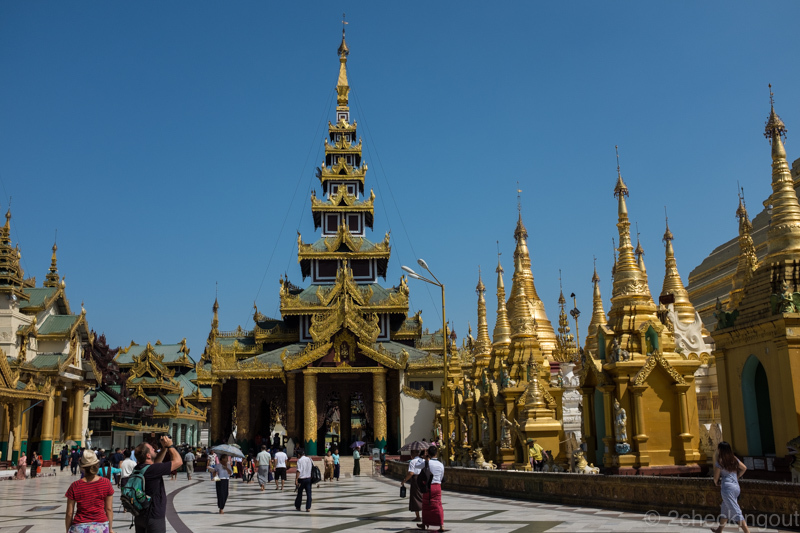 After exploring Yangon (A Guide to Visiting Myanmar Part 1: What to Do in Yangon), it was time to move on, and we were excited. 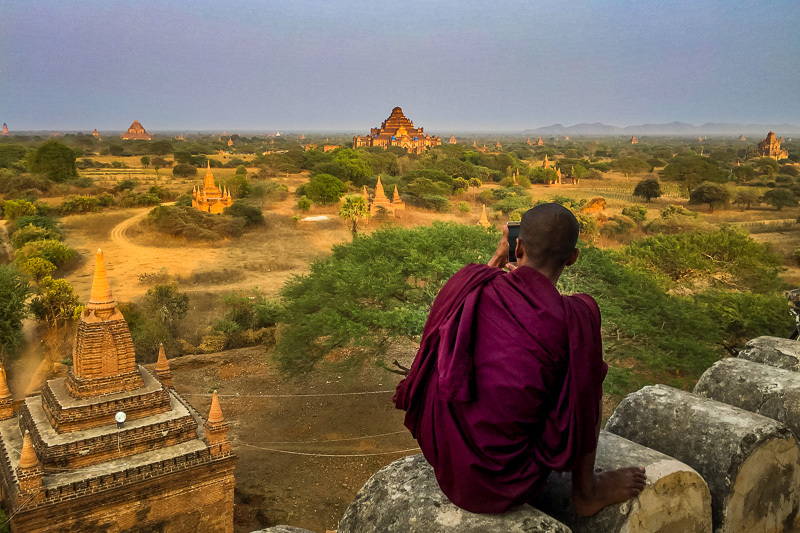 The Bagan temples should be on everybody’s travel bucket list. Up there with Angkor Wat, The Great Pyramids, and Petra for archaeological wow factor. Although it isn’t until you get there, you appreciate the vastness and scale of the Bagan Plains. Jumping into a taxi for the ride to the bus station was the start of a nail-biting “will we make it” journey. A trip that should have taken 30 minutes stretched into well over an hour and a half. Thanks to Friday holiday traffic. But the stress didn’t stop there. The bus station is more of a small town than a bus depot. Riding around and around we were pointed in different directions every time the driver asked for help.The clock continued ticking, and our stress levels reached boiling point. After what seemed like an age, we located JJ Express Buses, with just 10 minutes to spare, phew. We had booked the seats right at the front with the hope that this would help with any travel sickness. Top travel tip… if you’re on an overnight bus, sitting right behind the driver is not going to help you get much sleep. Our drivers kept up a steady stream of chatter for the whole 9-hour journey, occasionally bursting into fits of giggles (aided by constant betel nut chewing). Next time we will be sitting further back cuddling a sick bag. At least we’ll get some sleep. 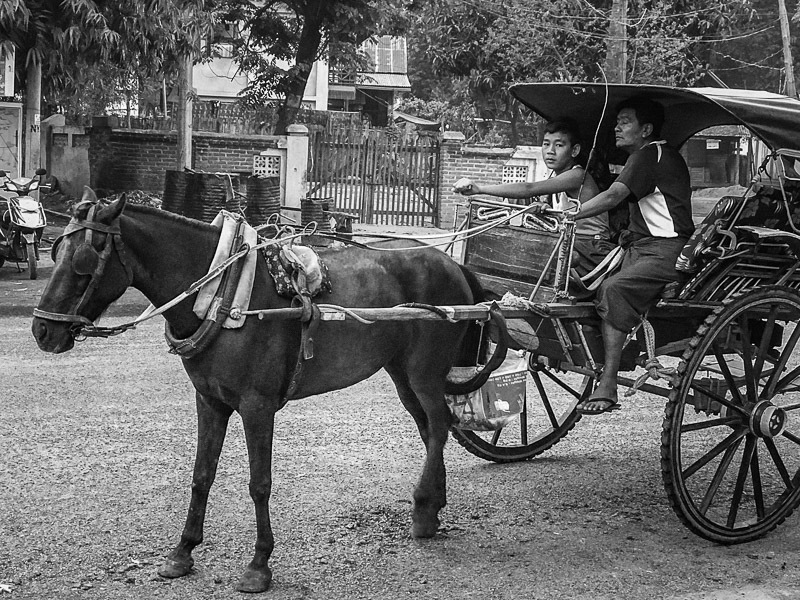 Dropped off at the edge of Nyaung-U, a small town just a few kilometres from Old Bagan, we were then ferried to the Shwe Na Di Guest House by horse and cart, for NZ$7 (US$5). This was no New York City carriage ride. I had a vice-like grip to stop myself from sliding off the back and bouncing along the dusty road. Not your New York City carriage ride. Exhausted we eagerly paid the upgrade for a room with en-suite and collapsed on the bed. But after a few minutes rest, we were like a couple of kids at first snow. Eager to get out and explore in case the famous Bagan temples melted away before we saw them. It is thought that over 10,000 temples, pagodas and monasteries were built in the region between 1044 to 1287. The region ceased to be the capital of Burma back in the late 13th century. This change, the passing of time, and several hundred earthquakes have reduced much of the area’s former glory. The last earthquake in August 2016 destroyed 400 temples and severely damaged several other key sites. Today just over two thousand temples remain. Some in excellent condition, many just stumps of their former glory. When you look at the horizon, all you can see is temple after temple. Heaven knows how glorious the view must have been back in the heyday. Temples as far as the eye can see. We had two full days in Bagan, including our arrival day. Kind of enough time, but if you’re super serious about photography, you’re going to want a week here. And there’s a great cost-effective way to explore. Electric scooters, known locally as e-bikes, are available to hire for around NZ$6 (US$4) per day from most guesthouses and various vendors in town. Make sure you do all the usual checks, brakes, lights, signs of damage, and that the bike is fully charged. E-bikes are a fantastic environmentally friendly way to cram in as many temples as possible in an area that stretches for 13 square kilometres. And the joy of the electric scooter is that you’re free to roam anywhere you choose and at your own pace. Quiet too, which adds to the serenity. Needing to eat before we headed out we found a great little place called Leo’s. The owner was chatty and welcoming providing us with local recommendations on where best to visit. And they served delicious food, a mixture of Burmese and Western. Fully charged we set off to satisfy our inner Indiana Jones. Ducking and diving down sandy side roads we soon found ourselves alone. Excitedly pointing out pagodas and temples left, right and centre, the afternoon flew by. One of the more spectacular and popular ways to experience the Bagan Plains is from a hot air balloon. Colourful balloons take to the skies at sunrise enhancing many a photo. The views must be mind-blowing. We arrived at the end of the ballooning season, and the cost made it difficult to justify. Starting at NZ$450 (US$315) each, it’s incredibly expensive. But in hindsight, it’s one of those experiences that maybe we should have just bitten the bullet and said you only live once. 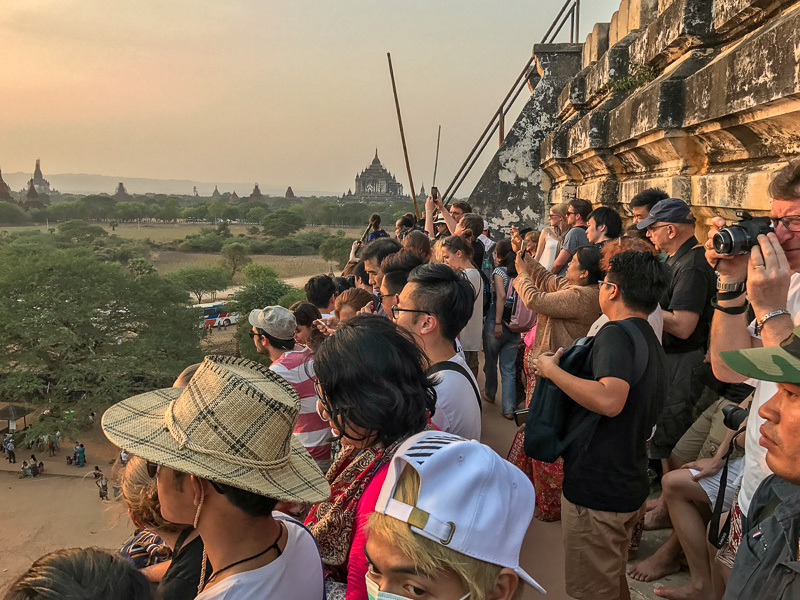 Along with most of the visitors to Bagan, (well those who couldn’t afford balloon rides) we headed to Shwesandaw Pagoda for sunset. The vast array of shoes and flip-flops at the bottom of the central stairway an indication that this is a popular spot. Sunset at Shwesandaw Pagoda. 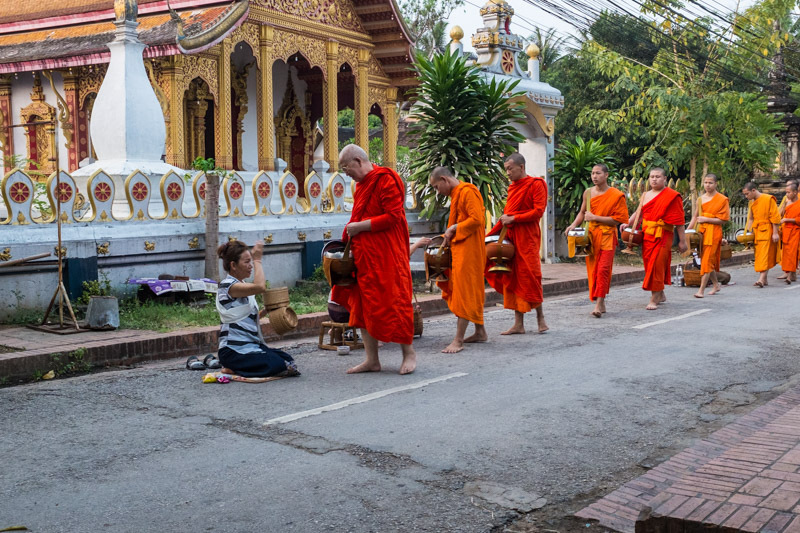 Even the Buddhist Monks love a photo opp. Quick tip.. get here early if you want to be able to capture a glorious sunset without bobbing heads getting in the way. 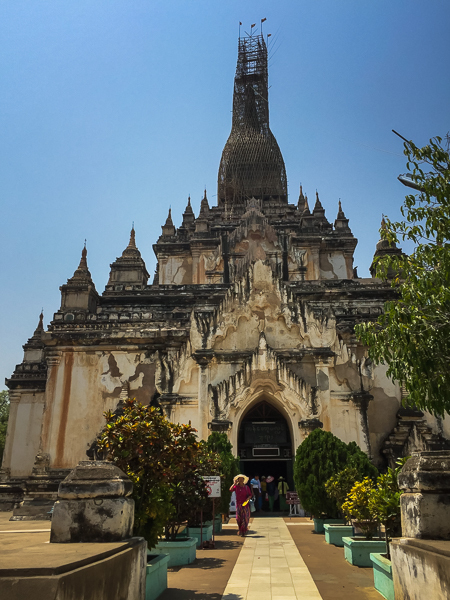 Built in 1057 the pagoda has five terraces, although the top level was closed off at the time of our visit. The beautiful cylindrical stupa stands proudly across the Plain. As soon as the sun sets you’re shooed off the temple and run the gauntlet of polite hawkers keen for you to view their paintings and other trinkets. The Shwesandaw Pagoda is also a great spot for sunrise, and surprisedly just as busy as sunset. This vast complex with it’s four standing Buddhas (pointing North, South, East and West) has been carefully restored and gives a glimpse of what life must have like when all the temples were first built. Word of warning, in the midday heat the tiled floor gets blisteringly hot under your bare feet. The Westminster Abbey of Burma, Ananda Temple. We guided our trusty e-bike (which coped well with two passengers) off the main road and headed down to the Ayeyarwaddy River. Here we found a beautiful quiet ruin with no tourists. Just a loved-up couple of local kids for company, we all watched the sun dip over the river. Sunset on the Ayeyarwaddy River. Another perfect end to another perfect day. A couple of other striking temples to visit are, Sulamani and its next-door neighbour Thabeik Hmauk. Sulamani is relatively busy, with a few traders trying to tempt you (easily done when they are so pretty) with postcards, local paintings and artefacts. Inside the temple, some great examples of frescoes from the early part of the 12th century remain. Thabiek is much quieter, in fact, we were the only ones there, apart from a local chap. 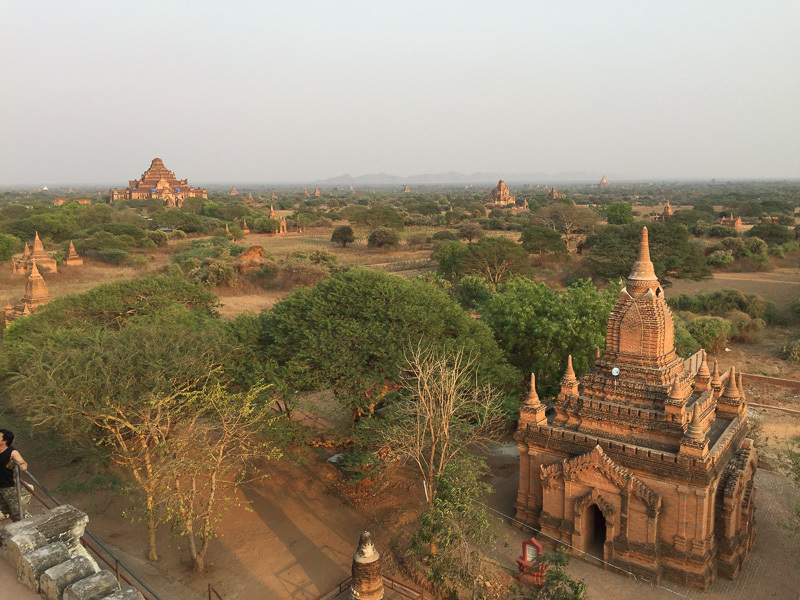 In the typically Myanmarese way, he gently and helpfully showed us a tiny cubby hole in the wall which leads to the top giving spectacular 360° views of the Bagan Plains. It would have been easy to miss this hidden terrace access. After snapping some photos, we turned around to find that our helper had laid out his paintings on the floor for us to view with the hope that we would make a purchase. Not having any walls to hang paintings on seemed like a lame (but true) excuse. We did try and tip the guy for showing us the temple, but he was having none of it. He was not even grumpy. Another example of why we love the Myanmar people so much. Close to our hostel is the Shwezigon Pagoda. Completed in 1102, this enormous temple with its golden stupa glistening under the lights comes alive in the evening with local families congregating. It certainly does not feel like a tourist temple. I’m pretty sure we were the only gringos there on the night that we visited. 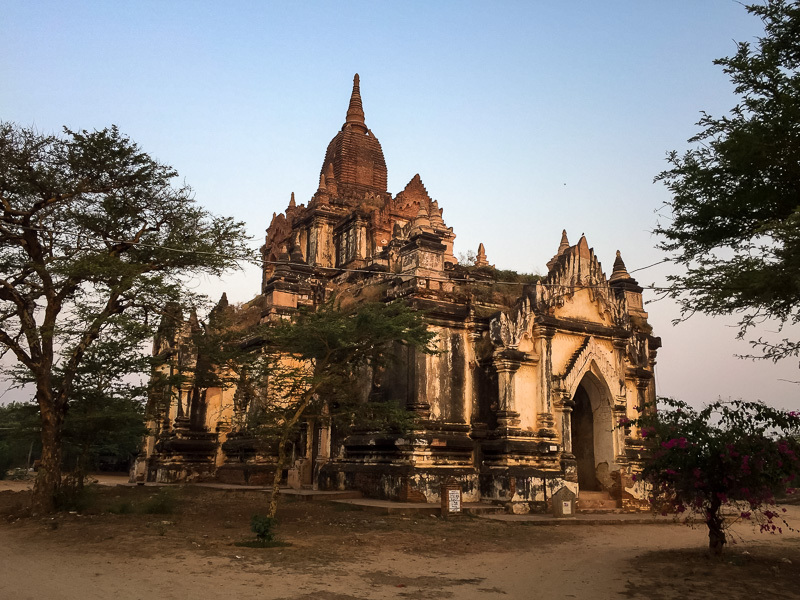 Bagan is a magical place, whether it’s exploring a ruin on your own, sitting on a temple terrace watching the sun dip or negotiating with a cheeky local trader. Disappearing off the main road is almost like being transported back in time. 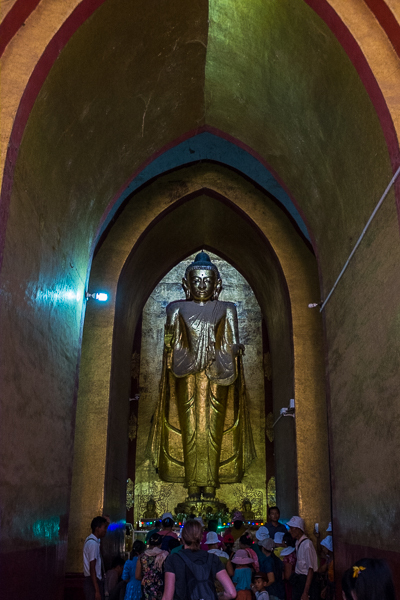 It’s no surprise why its top of the ‘must do list’ when visiting Myanmar. That said you can escape the tour groups easily. You do not get the same level of crowds as Angkor Wat or The Pyramids. We could have quite easily spent another couple of days exploring rather than heading to Mandalay. The people we met were super relaxed, happy and smiley, keen for you to enjoy this treasure of a landscape. It’s touristy with a small ’t’, for now anyway. We would go back in a heartbeat. Temple heaven, spot the tourist! For more Bagan photos, click here. Next up, in the final part of our Myanmar Guide, we take a very slow train to Inle Lake before chilling at the beach, Myanmar style. Where The 2017 Water Festival kicks off with a vengeance. JJ Express VIP Bus from Yangon to Bagan, NZ$21 (US$15) each for the overnight journey. You can fly from Yangon for around NZ$140 (US$96), and it takes 1.5 hours. 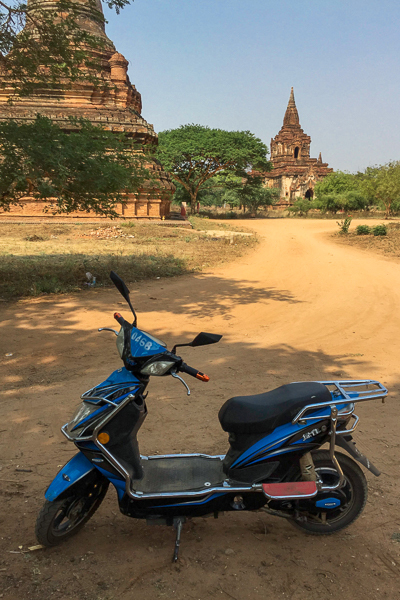 For us, the difference between the airfare and the bus fare covered the accommodation, e-bike hire, meals, and the Bagan Archaeological Zone Fee (NZ$27/US$18, valid for five days). Shwe Ni Di Guest House, NZ$36.45 (US$25) for a double room with ensuite and breakfast. Highly recommended. Our room was clean and tidy, helpful staff, and just a 15-minute ride away from the main temples. Leo’s Restaurant, friendly owner, very helpful. Food is excellent, less than NZ$10 (US$7) for lunch for two. Bibo Restaurant, NZ$17 (US$12) for four mojitos (it had been a long dusty day), two main courses and pancakes for dessert. Lovely setting, friendly staff and fantastic food. Moon Restaurant, NZ$14 (US$10) for two curry dishes. Speciality vegetarian restaurant, garden setting, pretty close to the main temples. 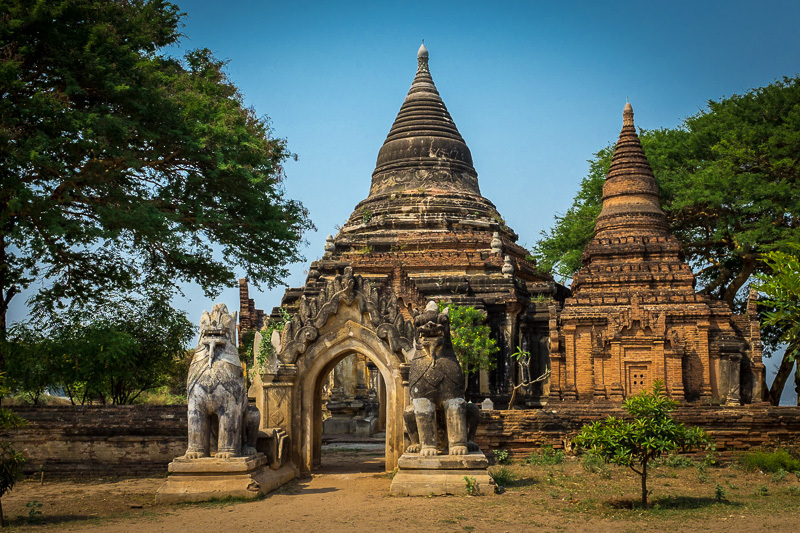 There is a Bagan Archaeological Zone entrance fee of NZ$26 (US$18) per person. This is paid at a booth between the bus station/airport and the main town. The electric scooter cost NZ$6 ($4) per day, hired from our guest house. If you would like to support the Oxfam Emergency Appeal, please click here.